Gilbert Frew, a firefighter with the Lima Fire Department, testified on his own behalf Wednesday as the final witness in his jury trial. After more than eight hours of deliberation, jurors found Frew not guilty of one count of gross sexual imposition and could not come to a unanimous decision on an identical count, leading to a mistrial. Gilbert Frew, left, answers questions posed by his defense attorney, William Kluge, while on the witness stand at his jury trial Wddnesday. 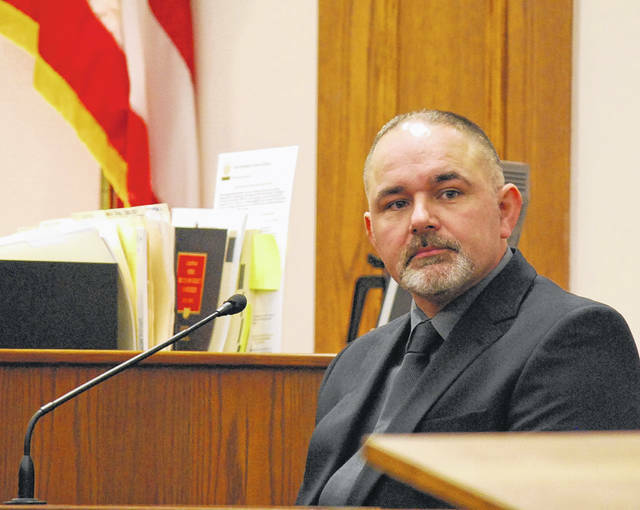 LIMA — A Lima firefighter walked out of court a free man Wednesday night after an Allen County Common Pleas Court jury acquitted him of one count of gross sexual imposition and failed to reach a unanimous verdict on a similar count. Jurors deliberated for more than eight hours before returning the lone not guilty verdict against Gilbert Frew, a fireman employed by the City of Lima who prosecutors claimed had inappropriately fondled two young girls. After deliberating for more than five hours, jurors at approximately 4 p.m. informed the court bailiff they had reached an impasse on one of the counts. Judge Jeffrey Reed called the jurors back into court and instructed them to resume deliberations until such time that it became apparent they would be unable to resolve their differences. At shortly after 7:30 p.m., jurors knocked on the door and said they were deadlocked. Reed said he would accept that decision and declared a mistrial on count 1 of the indictment. Assistant Prosecuting Attorney Tony Miller said his office would consider all options on how to proceed with the one count on which jurors were hung. “It’s too early to say right now” how the prosecutor’s office will move forward, Miller said. During the trial’s opening day Tuesday, the two alleged victims, now ages 15 and 11, took the witness stand and told jurors of frequent instances of unwanted touches to their breasts, buttocks and vaginal areas during “massages” or “back rubs” administered by Frew, at their request. Both girls struggled to maintain their composure during testimony about topics that were at times difficult for them to discuss. Frew, 42, resided in Spencerville when the alleged acts took place. He currently lives with his ex-wife in Buckland. Frew took the witness stand Wednesday morning as the final witness in his two-day trial. He denied intentionally touching either of the two girls inappropriately. He said his hands may have touched some private areas on the girls’ bodies “accidentally” but never for the purpose of sexual gratification. 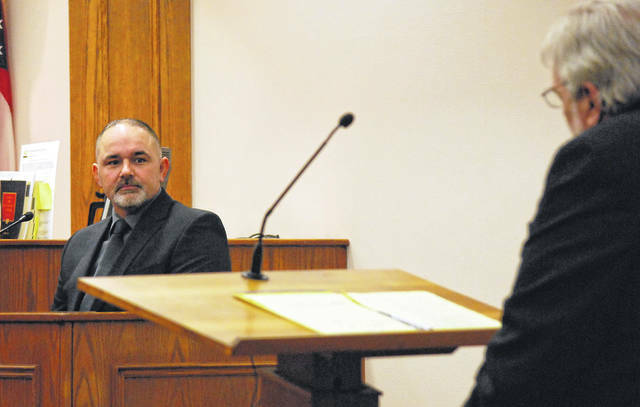 Miller, in his cross-examination of Frew, attempted to contrast the defendant’s statements on the witness stand to those made to investigators with the Spencerville Police Department. Miller pointed out that Frew initially told police he “never” touched the girls in inappropriate area, but later conceded that some “accidental” touches may have occurred. During closing arguments, defense attorney William Kluge told jurors that the desire to give or receive sexual gratification is a key element of the charge of gross sexual imposition. Miller, in his closing remarks to jurors, alleged that Frew was “grooming the girls; testing them to see what he could get away with” while administering massages. “And were his actions for the purpose of sexual arousal? Of court they were. It’s too easy to say now that it was all just an accident,” Miller said.